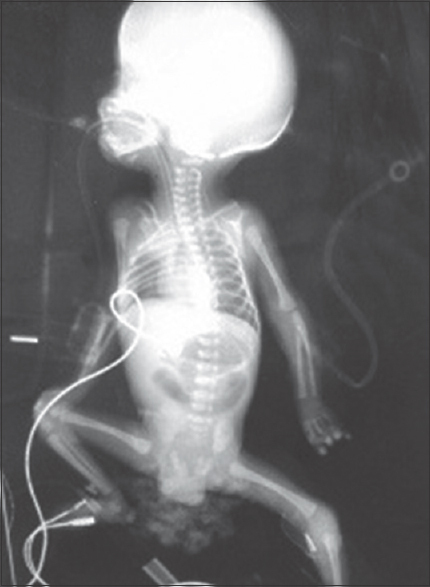 Intussusception is an extremely rare clinical entity in neonates, especially among premature ones., This clinical entity is confused with other causes of intestinal obstruction making delays in correct diagnosis. We report a case of intussusception in a preterm neonate of 30 weeks of gestation whose initial diagnosis was made as necrotizing enterocolitis (NEC) and turned out to be jejunojejunal intussusception with bowel gangrene on exploratory laparotomy. We report the case to create awareness regarding the rare entity for which a high degree of suspicion is needed to avoid delay and unnecessary management. A preterm male neonate, weighing 1160 g, was delivered by cesarean section for severe maternal preeclampsia at 30 weeks of gestation. The Apgar score was one at 1st min. Hence, he was managed on assisted ventilation immediately after birth in view of severe birth asphyxia with no spontaneous respiration. Natural surfactant-beractant was administered through endotracheal tube at 100 mg/kg dose within 30 min of life for respiratory distress syndrome. Total parenteral nutrition (TPN) was initiated from day of life one, and breast milk feeding with orogastric tube was started on the day of life two. His general condition remained stable until day of life four. Neonate developed bilious vomiting with coffee-ground colored orogastric aspirate and progressive abdominal distension. He passed a small amount of meconium daily. Initial X-ray abdomen and pelvis [Figure 1] showed generalized bowel dilatation without pneumatosis intestinalis or free air. Complete blood counts and serum electrolytes were found within normal limits. Arterial blood gas showed compensated metabolic acidosis. C-reactive protein (CRP) was 7 mg/L. NEC was suspected. Orogastric feedings were discontinued on the same day, and umbilical catheters were removed. Broad-spectrum antibiotics were started. The patient had same findings till 18 h of onset of the event after which there was increase in abdominal girth. Repeated X-ray showed few dilated bowel loops in center surrounded by ground glass opacity [Figure 2]. Abdominal ultrasound showed mild interbowel-free fluid, dilated bowel loops and none other details could be seen due to gaseous distention of bowel loops which created a difficulty in ultrasound-guided needle aspiration. The neonate was intervened for intraperitoneal drain placement which revealed scanty amount of serous peritoneal fluid. After 12 h of drain placement, the clinical condition of the patient did not improve, but abdominal distension continued with dilated fixed bowel loops on repeat X-ray [exactly same as [Figure 2]. 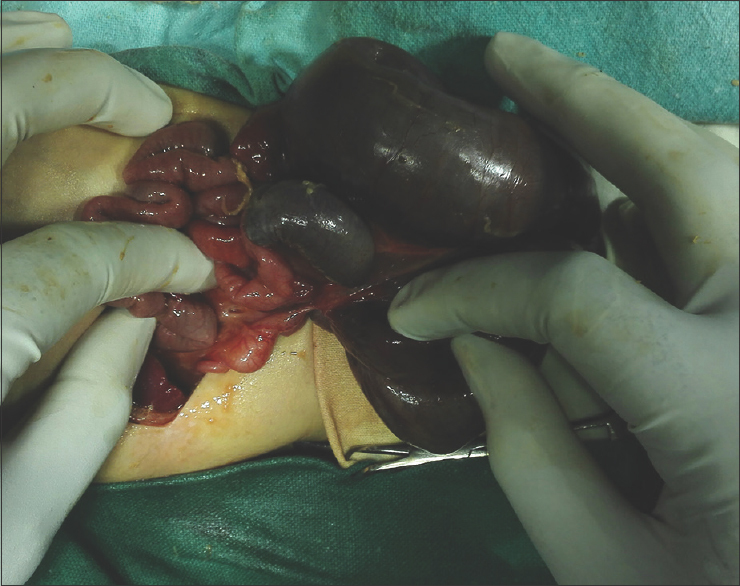 The patient was taken for urgent exploratory laparotomy which revealed a jejunojejunal intussusception at 38 cm from ligament of Treitz, with proximal dilated and gangrenous bowel [Figure 3]. The proximal bowel gangrene was probably because of excessive distention leading to luminal venous followed by arterial compression. Resection of gangrenous necrotic segment of length 32 cm and diverting double-barrel jejunostomy and ileostomy were performed. The total remaining small bowel length was 5 cm from duodenojejunal flexure and 20 cm with the intact ileocaecal valve. Postoperatively, neonate was managed on TPN and broad-spectrum antibiotics such as meropenem and metronidazole. Repeat CRP was 78 mg/L, and blood culture grew Gram-negative bacilli sensitive to meropenem. The baby continued to progress with disseminated intravascular coagulopathy, and on postoperative day 3, the patient died. Histopathology report of resected bowel showed transmural infarction and jejunal intussusception without leading point. In our case, NEC was the first diagnosis made on clinical and radiological findings basis which lead a baby to have further consequences of gangrene and sepsis. Hence, we report the case to create awareness about the rare entity. In the neonatal period, the reported incidence of intussusception is 0.3%–2.7%., It is exceedingly rare in premature neonates. Clinical signs of intussusception are abdominal distension, bilious aspirate in Ryle's tube, intolerance to feeds, per-rectal passage of currant jelly stools or bleeding. These are very similar to signs of NEC, especially considering preterm population. 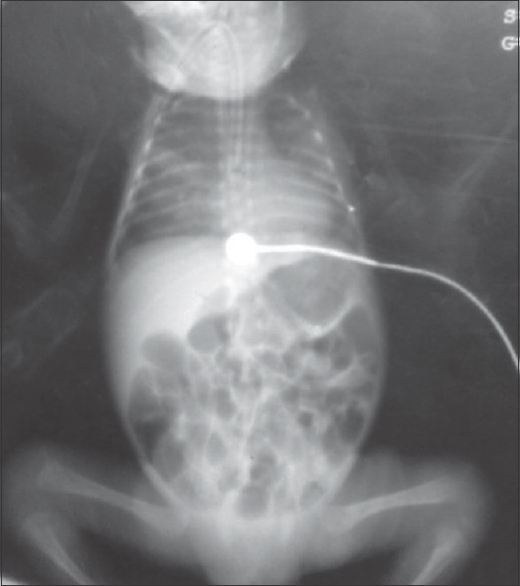 Plain abdominal radiographic imaging in neonatal intussusception is generally unremarkable with features of obstruction such as multiple air-fluid levels or dilatation of bowel loops. Although ultrasonography of abdomen has high sensitivity in identifying lead point and intussusceptions,,,, distended bowel loops overlapping the intussusception may obscure it masking and delaying correct diagnosis. Unlike in older children, etiology of intussusception remains unclear in most neonatal cases, but sometimes, meconium plugs, duplication cyst, hamartoma, and Meckel's diverticulum are seen as pathological leading points (PLP). In premature neonates, intestinal dysmotility and stricture, as a result of perinatal insult leading to intestinal hypoperfusion/hypoxia, may act as a leading point for intussusception. In cases of intussusceptions of large bowel or ileocolic region (which have not progressed to gangrene); hydrostatic reduction with fluoroscopic guidance can be attempted. While if any intussusception is found on exploratory laparotomy, manual reduction, or resection of PLP or gangrenous portion, whichever applicable for the specific site and status of bowel involved, remains the treatment of choice. The prognosis is good if case is timely managed and not associated with gangrene, sepsis, comorbidities due to prematurity. To avoid the delay in correct diagnosis, treating clinicians should be aware of entity “intussusception in neonates” although they will face such conditions rarely. Only high degree of suspicion and timely exploratory laparotomy will help to lead diagnosis of intussusceptions, which have not been detected even radiologically. Preterm neonatal intussusception is an uncommon entity about which treating doctor should be aware of. Similar clinical and radiological findings can also be due to other conditions, and high index of suspicion is needed for timely diagnosis and useful intervention for intussusception. This study was supported by LTMMC, Sion. Bothara VP, Pandey A, Rawat J. Neonatal intussusception: A review. J Neonatal Surg 2018;7:5. Price KJ, Roberton NR, Pearse RG. Intussusception in preterm infants. Arch Dis Child 1993;68:41-2. Ein SH, Marshall DG, Girvan D. Peritoneal drainage under local anesthesia for perforations from necrotizing enterocolitis. J Pediatr Surg 1977;12:963-7. Ohuoba E, Fruhman G, Olutoye O, Zacharias N. Perinatal survival of a fetus with intestinal volvulus and intussusception: A case report and review of the literature. AJP Rep 2013;3:107-12. Avansino JR, Bjerke S, Hendrickson M, Stelzner M, Sawin R. Clinical features and treatment outcome of intussusception in premature neonates. J Pediatr Surg 2003;38:1818-21.